We are offering Embroidered Ladies Suit to our client. We design and put forth a range of Embroidered Wedding Suits that are a perfect blend of contemporary designs & the latest fashion trends. Our range of Wedding Suits are available in a plethora of designs and cuts. These Wedding Suits are available in different sizes, designs and colors. SANTOON SALWAR & PURE VELVET KAMEEZ IN LIGHT STONES, PATCH, THREAD VELVET BOOTI WORK & VELVET LACE BORDER CHIFFON DUPATTA. Our offered range of Lime Embroidered Suit is manufactured and supplier from great quality material and is suitably tested on various quality parameters by our professionals. The offered Embroidery Suits is specially designed by our experts with the current fashion trends. Our organization has successfully expanded its business in market owing to the offered elevated quality array of Embroidery Cotton Salwar Suit. The offered cotton suit is designed by vendors' experts using premium quality cotton fabric and modern techniques. 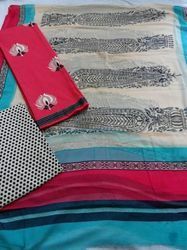 We also provide dress material or unstitched suits material. Exotic, Gorgeous and Marvellous Bollywood Salwars Suits, specially designed to suit the women of the moment. The embroidery work and the embellishments with fascinating patterns are fabulously designed to further glamourise the ensembles. Would prove the best choice for you to unveil the world of fashion. Make bollywood a part of your life just at the click of your mouse.